Steelray Project Viewer lets you open, print, and export Microsoft Project mpp files and view the information in them without requiring Microsoft Project. Steelray is the world's first project navigator and first project search engine. Steelray supports all standard views from Microsoft Project, has task updates, printing, exporting, etc. 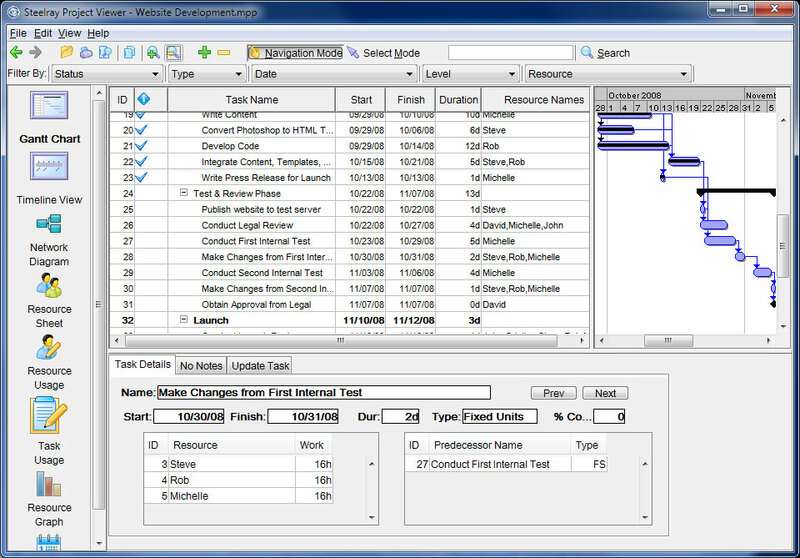 Steelray runs on Windows, Mac, and Linux and supports all versions of Microsoft Project since Project 98. An internet telephone. As simple as an instant messenger. Now you're talking. Qweas is providing links to Steelray Project Viewer 3.8.2 as a courtesy, and makes no representations regarding Steelray Project Viewer or any other applications or any information related thereto. Any questions, complaints or claims regarding this application Steelray Project Viewer 3.8.2 must be directed to the appropriate software vendor. You may click the publisher link of Steelray Project Viewer on the top of this page to get more details about the vendor.